There is no question, being an NFL head coach takes its toll on the body. It takes its toll mentally and physically. We saw that first hand with Arizona Cardinals coach Bruce Arians this past season. We previously reported that Arians was returning next season. There had been some doubt, mainly due to his health. Arians left the team in the preseason while on a road trip in San Diego to take a hospital trip. Arians also took a trip to the hospital in November after returning from a road trip to Minnesota. 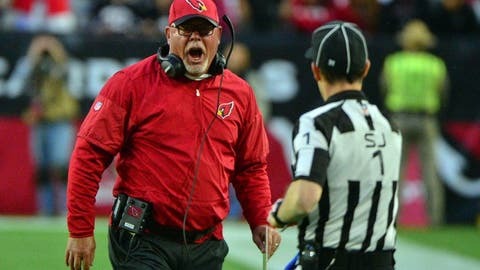 He looked red hot that day as the Cardinals dropped an important game in the NFC playoff race. Arians turned out to be fine after both instances. He is going to take the next six weeks or so to get his health issues taken care of before diving into the offseason preparation for the 2017 season. Luckily this is just a shoulder issue. With the retirement of now former Denver Broncos head coach Gary Kubiak on Monday, it does again beg the question, should we be concerned with the stresses of the job? Kubiak indicated he lacked sleep. He’s also dealt with a couple of other health issues over the last few seasons. When Jon Gruden was a head coach with the Oakland Raiders, he used to brag about not going home to sleep. He would lay down for a couple of hours on a couch in his office and get back at it. Is it worth the price of your health to be an NFL head coach and should the NFL be concerned? Every individual is different though. The game has changed somewhat over the years but there has always been the same preparation ahead of gameday. When I was a ball boy with the Cardinals, Gene Stallings was the head coach my first season I was with them. One day during training camp, I walked into the locker room at NAU’s Skydome and there he was, sleeping on a long table, trying to grab a few minutes of shut eye with no one else around. No doubt, Stallings was a hard worker. He went on to win a national championship at Alabama. Football came first. These days, for the head coach, football presumably still comes first for all. It did for Kubiak and he knew it was no longer a good fit. The game he has loved for a long time has now started interfering with his health. Good for him to recognize it and walk away. Let’s hope if there are more in his situation, they come to the same conclusion.